Thomas Rhett’s musical personality was created by radio. Years before his career began, the young Southerner spent his time listening to the sounds of FM radio. “Growing up, there was no such thing as listening to one radio station,” he remembers. Instead, Thomas would regularly flip from one station to another, cranking up a mix of country, pop, R&B, rap, rock, and oldies. It was a tangle of music that helped shape the DNA of one of country music’s hottest stars. Born in Valdosta, Georgia in March 1990, Thomas is the son of songwriter Rhett Akins, who had major success of his own on Decca in the mid-1990s, including a country No. 1 with ‘Don’t Get Me Started.' Thomas’s own chart debut came in 2012 with the single ‘Something To Do With My Hands,’ a top 20 success, and after further singles and a self-titled EP, his debut album It Goes Like This followed in 2013. It spawned five Top 40 hits, three country airplay No.1s and five sales hits, including a major breakthrough single with the title track. All of this helped him secure a New Artist of The Year nomination at the American Country Awards. As well as ‘It Goes Like This,’ the album housed the further airplay chart-toppers ‘Get Me Some of That’ and ‘Make Me Wanna.’ It was recorded in Nashville and produced by Jay Joyce, Michael Knox and Luke Laird. It prompted one reviewer to say: “It's full of energy, good humour, and the kind of backroad good-old-boy wisdom that everybody seems to love.” Helped, no doubt, by the fact that Rhett, father and son, co-wrote five of the songs, with Thomas’s dad also adding backing vocals. 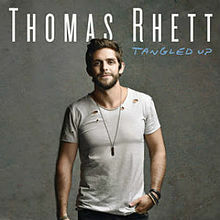 Two years later and Rhett was tipping his hat to his days of listening to a swathe of radio stations as he unveiled his sophomore 2015 release Tangled Up, an album that mixes the sound of his influences with equal doses of groove, melody and twang. Although recorded in his hometown of Nashville, Tangled Up was written all over America, during a year-long tour in support of Rhett’s first album. Like many performers, he was inspired by being on the road to write and was helped by a select handful of co-writers, again including his father, to come up with an album of powerful songs that further enhanced his profile. Tangled Up is such an upbeat, energetic record, its momentum no doubt inspired by being on stage, as Thomas himself explains, “At our shows, there aren’t any rules,” he says. “There’s no such thing as standing still and just singing a song. I love jumping into the crowd. I love to dance. The whole show is very up-tempo, high energy, and completely unpredictable." Produced by Dan Huff and Jesse Frasure, the album is filled with party anthems, dance tunes, drinking songs, love ballads and everything in between, all tied together by a dynamic and charismatic singer, unafraid to blur the lines between genres. Some songs seem influenced by country stars such as Eric Church, others are more reminiscent of Justin Timberlake or Bruno Mars. None of the tracks sound alike, and yet with his musical personality now established, they all sound like Thomas Rhett songs. ‘Crash and Burn,’ the album’s first single, entered the country charts long before the album’s release, and hit No. 1 in airplay in the very week that Tangled Up hit the street. Any number of the remaining tracks, from ‘South Side’ (a groove-heavy number co-written with Chris Stapleton) to ‘Die a Happy Man’ (a heartfelt tribute to Thomas’ wife) have big hit written all over them; indeed the latter song went on to top both the sales and airplay charts. On the title track, there’s even a nod to Michael Jackson’s dance floor jams. Rhett’s fast-moving career as one of the premier artists in the Big Machine Label Group has had him expanding country music’s borders to include the UK: he has been extensively supported by BBC Radio 2, where he travelled in March 2016 to star at the Country to Country Festival. It was his namesake Rhett Butler in Gone With The Wind who uttered the immortal line "Frankly, my dear, I don't give a damn.” But when it comes to Thomas Rhett’s music, everybody does. Thomas Rhett had a pretty good run in the 2000s. The son of country crooner and singer and songwriter Rhett Akins, he's written hits for Jason Aldean ("I Ain't Ready to Quit") and Florida Georgia Line ("Round Here"), as well as putting two of his own singles ("Something to Do with My Hands" and "Beer with Jesus") in the Top 30 country charts, and he hit the top spot in the summer of 2013 with a third single, "It Goes Like This," all of which will earn this debut album a whole lot of attention. Luckily for Rhett, he's ready, and this set, which features the kind of deep, drawled southern vocals and more-rock-and-pop-than-country production that passes for country music a decade and change into the 21st century, will undoubtedly generate another charting single or two, all of which means Rhett is poised to be the next big thing in the genre. It's a solidly professional outing, featuring all three of his singles and other tracks of similar construction, and it's full of energy, good humor, and the kind of backroad good-old-boy wisdom that everybody seems to love these days, even if it feeds more off nostalgia than reality. There really aren't any slack cuts here, although one track, "Sorry for Partyin'," a drunken lurch of a waltz if ever there was one, is a particular highlight. This album should put Rhett over the top as a contemporary country star. 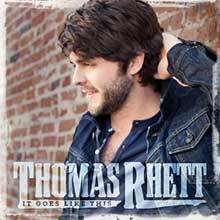 Thomas Rhett had hits off his 2013 debut It Goes Like This, but Tangled Up, its 2015 successor, feels like the album where the singer/songwriter comes into his own by borrowing moves from fellow country bros Florida Georgia Line and Sam Hunt. Rhett wrote for FGL -- specifically, the hit "Round Here" -- but Tangled Up is by no means as aggressively macho as that duo. It capitalizes on Rhett's soulful streak -- strip away the 21st century consumerism and "Die a Happy Man" easily could've come out of Muscle Shoals in the late '60s -- and also his humor and his allegiance to good times that don't necessarily come from either a honky tonk or a sports bar. Rhett displays an omnivorous cultural appetite that shows he's a millennial: underneath his acoustic guitars are lightly looped beats, but he's also just as likely to push disco to the forefront, as he does on "I Feel Good" and a title track that's happily a glitter ball throwback. Rhett may switch on a Totally '80s Flashback weekend when he's chilling out, but he's a modern guy, dropping passing allusions to Guns N' Roses and Third Eye Blind, hoisting Solo cups filled with Bud Light Lime and splashes of liquor in coconut water, aware that his excursions in neo-disco may bring Michael Jackson to mind but they also sound a bit like Sam Hunt or the Weeknd. By playing both sides of the fence, Rhett may be a bit of an opportunist, but as his hit "Crash and Burn" indicates, there's a sly charm to his eager-to-please modern country: he's a true pop artist, harnessing the trends of his time and turning them into music that's hard to resist.